Every sewing room needs to be stocked with a few basic supplies: sewing fabric, hand sewing needles, embroidery thread and floss, sewing patterns, shears, rulers, and of course, a sewing machine. Those are just some of the basic sewing tools that every seamstress should have on-hand. Of course, you probably have more than that, too, depending on the type of sewing that you do and your experience. Whether you’re a novice who’s just starting and learning the ropes with the assistance of sewing help guides, or you’ve been working with a needle and thread for years and have truly mastered your craft, there’s no doubt that there’s another item that you have: a pincushion. Pincushions, as the name suggest, serve as a safe space to store and easily access all of those pins and needles that you work with. In fact, you probably have more than one pincushion lying around; perhaps a half-dozen or more. While these cushions certainly come in variety of shapes and sizes, there seems to be one design that’s seen more often than others: the tomato. Have you ever wondered why a cushion that is intended to hold pins and needles is shaped like a piece of fruit? Seems pretty random, doesn’t it? Well, we did a little digging and much to our surprise, we found out that the tomato design isn’t random at all; in fact, there’s actually a sound reason for the shape. Before we dive into the tomato-shaped design, let’s take a look at the history of the pincushion. They’ve been around since the Middle Ages (but back then, they went by different names, like a pin-poppet, or a pyn pillow). As you probably guessed, the pincushion was created as a practical storage solution for pins and needles. They also had another purpose: these cushions were a way to display collections of pins and needles. Back then, these sewing tools were quite pricy, so people proudly flaunted their collections to showcase their riches. Like today, the first pincushions were made in a variety of designs, including boxes, animals, and even dolls. While they were useful, they seemed to be lacking… until someone decided to invent the classic tomato-shaped pincushion. Back in Victorian ages, people were quite superstitious. It was believed that setting a tomato on the mantle of a new home would keep evil spirits away and bring those who lived in the house luck and prosperity. Of course, tomatoes weren’t always in season and you couldn’t just pick up a tomato at your local grocery store. So, people got creative and decided to craft their own tomatoes out of red material stuffed with sawdust to cast away the evil spirits, even when the real fruit couldn’t be found. As mentioned, back then, people loved to flaunt their collections of pins, and what better way to showcase them than in a cushion that resembled a fruit that offered protection? 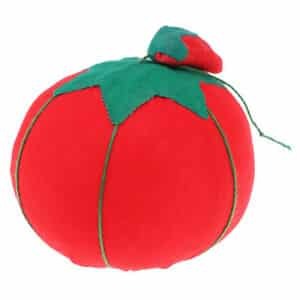 The popularity of the tomato pincushion has endured for hundreds of years, and it probably will continue to be the most popular of all pincushions for years to come. So, the next time you grab a pin from a tomato, just imagine how impressed your friends would have been by your collection of pins and needles.